Jane Winslow is an independent producer, director, editor, DP, consultant, and still photographer. Her production company, FireDancer Productions, specializes in documentaries, promo/training and live performing arts programs. 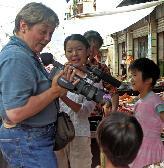 Jane has worked as a segment director and Director of Photography for Hallmark Channel, was principle photographer and editor for a Pilgrimage for Peace involving Tibetan refugees, co-producer, director and editor on BeComing: Women's Circles, Women's Lives. Also Jane has worked at TV stations and production/post-production houses in a variety of production positions including editor, technical director, audio engineer, and master control. As an assistant professor of broadcast and digital filmmaking in the School of Communication, Media & the Arts at SUNY Oswego, Jane teaches video production, post-production, directing and screenwriting. Jane also is a consultant and workshop leader at various film festivals and art centers such as 911 Media Arts Seattle, Hazel Wolf Environmental Film Festival, University of Washington, and as a trainer/product specialist for Snell & Wilcox's HD Switcher/Digital Effects (DVE) equipment at NAB Las Vegas, IBC Amsterdam, NBC Network News Burbank, NBC Sports, CBS Sports, Entertainment Tonight, and the BBC to name a few. Jane has won awards such as the Neil Shipman Production Excellence Award in Producing (co-producer) form the Women in Film - Seattle, and a gold MCAi Emerald City Award of Achievement in the Educational Programming Division for Awareness, Options, Control - Take Control which used an all-student crew for production. As a still photographer, Jane has traveled and photographed extensively throughout Southeast Asia, Nepal, Europe, Greece, Turkey, Central and South America, as well as the US. 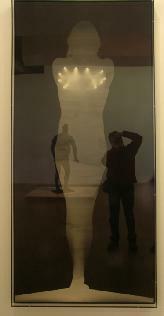 She shows in galleries exhibiting both her photography and video installations. her photos have been published in various publications such as Mandala Magazine and PATH Annual Report. All images and material © Jane Winslow 2001-2013. All rights reserved. Not to be used without permission.